a “back to basics” approach to identify fundamental flaws in user experience and to fix them – lag being the biggest target. 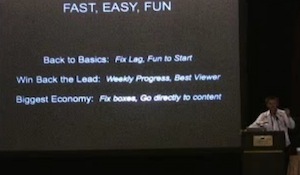 The take-home message from the presentation? Philip Rosedale is certainly back in the company with a vengeance, and the announcement of the roadmap and proposed changes is encouraging. That said, the Teen Grid closure and avatar complexity controls are likely to generate significant debate. Rosedale said himself in the presentation that delivering the promises is what counts – there’s been no shortage of promise previously, with some of it delivered. The ratio between the two needs to get to 1:1 for Second Life to have a fighting chance of long-term survival. The most encouraging aspect is that Linden Lab’s CEO seems to understand that this is likely the last big strategic route change they can make before concerns on Second Life’s viability become an urgent issue for the company. Over to you: what stands out for you as the positive and negative aspects of the Lab’s proposed direction? I’m tired of Linden Labs false promises, what makes this time any different to how they have worked previously? less staff = more work for individuals, how can he say we’re going to do software updates weekly and not have the staff or the in house morale to be able to perform that way? And as for Teens I hear they have been allowed to go copybot crazy, that’s how I hear they get stuff into the Teen grid by stealing it from the adult grid, with an influx of kids ready and willing to not pay for anything what defense do ordinary content creators have? Linden Labs does not have the Morale to pull this off, not after lay offs and laying off Qarl Linden who was actually capable and motivated to do such work. And there’s another lie from Philip Linden, if they have been “profitable” for years = no reason to lay off staff, or at least Qarl Linden. ” Philip Rosedale is certainly back in the company with a vengeance” kind of implies that all is not well eh? good luck Second Life, i used to care, but since my account was cancelled, i have nothing at stake anymore – see you on the OSGrid . . .